Protologue: Contr. Gray Herb. 59: 3 (1919). Pau de raio, sancalama (Po). Albizia zygia is widespread in tropical Africa, occurring from Senegal in the west to Kenya in the east and northern Angola and Tanzania in the south. The wood is known under the trade names nongo (general), red nongo (Uganda) and okuro (Ghana). It is used for indoor construction, light flooring, furniture, canoes, implements (e.g. pestles, hoe-handles), carving, veneer and plywood. It is also suitable for joinery, interior trim, ship and boat building, vehicle bodies, toys and novelties, turnery, boxes, crates, matches, hardboard and particle board. The wood is commonly used as firewood and for charcoal production. The wood pulp is suitable for paper production. Albizia zygia is planted as an ornamental shade tree, roadside tree and fire break. It is valued as a shade tree, e.g. in cocoa and coffee plantations, and as a support for yam. It is considered useful for soil improvement. Young leaves are eaten cooked as a vegetable or added to soups and sauces. The foliage is ranked as low-quality fodder, but suitable for use in goat feeds and sometimes also given to sheep and cattle. The flowers produce nectar which is collected by bees. The gum from the bark is used in the food industry (e.g. as a stabilizer in the preparation of ice cream), cosmetic industry (e.g. as a thickener) and pharmaceutical industry (e.g. as a drug coating). In traditional medicine, bark sap is instilled in the eyes to treat ophthalmia. A bark decoction is administered to treat bronchial diseases, fever (including malaria) and female sterility, and as a purgative, stomachic, antidote, vermifuge and aphrodisiac. Pounded or rasped bark is applied externally to treat yaws, sores, wounds and toothache. Ground roots are added to food to treat cough and as an expectorant. Leaf decoctions are used to treat fever and diarrhoea. Albizia zygia timber has some importance on the international market, although it is considered a lesser-used species. It is often mixed with timber of other Albizia spp. In Ghana the export volume of sawn Albizia timber in the first half of 2004 was 240 m³ with a value of about US$ 250,000. The heartwood is yellowish brown or pinkish brown to dark brown, sometimes with a red tinge, and distinctly demarcated from the wide pale yellow to grey sapwood. The grain is straight or interlocked, texture fine to coarse. Planed surfaces of the wood are lustrous. The wood is moderately heavy, with a density of 500–720 kg/m³ at 12% moisture content. It dries slowly, but generally with little degrade. The rates of shrinkage are moderate, from green to oven dry 3.0–3.4% radial and 5.7–7.1% tangential. Once dry, the wood is stable in service. At 12% moisture content, the modulus of rupture is 69–118 N/mm², modulus of elasticity 8400–12,000 N/mm², compression parallel to grain 42–65 N/mm², shear 11.5–16.5 N/mm², cleavage 18–108 N/mm, Janka side hardness 2790–5910 N and Janka end hardness 4500 N.
The wood generally saws and works fairly easily with ordinary hand and machine tools, but sawn surfaces tend to be woolly. A filler is recommended to obtain a good finish. The wood holds nails and screws well, but pre-boring is advised to prevent splitting. The gluing, staining and veneering properties are satisfactory, and steam bending properties moderate. The wood dust may cause irritation to nose and throat. The heartwood is fairly durable, but it is susceptible to termite attack and powder post beetles. The heartwood is resistant to impregnation with preservatives, but the sapwood is permeable. Experiments showed that Albizia zygia gum has good potential for use as compression coating for drugs targeting the colon, being capable of protecting the core tablet in the physiological environment of the stomach and small intestine, but susceptible to degradation by the colonic bacterial enzymes leading to release of the drug. The gum is also promising as binding agent in tablet formulations, especially when high mechanical strength and slower release rates are desired. The foliage has a high crude protein content (32%), but with a low in-vitro dry matter digestibility value (41.5%); it has been ranked as a low-value fodder. The wood of Albizia gummifera (J.F.Gmel.) C.A.Sm. is very similar to that of Albizia zygia and is used for similar purposes. Medium-sized deciduous tree up to 30 m tall; bole branchless for up to 15 m, straight and cylindrical, up to 80(–120) cm in diameter, without buttresses or with small, thick buttresses; bark pinkish or greenish grey, smooth or shallowly fissured, inner bark fibrous, yellowish to orange-brown, with darker stripes and brownish gum; crown dome-shaped, with spreading branches; young branches pubescent, but usually soon glabrescent. Leaves alternate, bipinnately compound with (1–)2–3(–4) pairs of pinnae; stipules awl-shaped, caducous; petiole 4–10 cm long, near the base of upper side with a sessile gland, rachis 2–13 cm long, pubescent but glabrescent; leaflets in 2–5 pairs per pinna, sessile, obliquely rhombic to elliptical, increasing in size from base to apex of pinna, up to 8(–11.5) cm × 4(–6) cm, obtuse to acute at apex, glabrous. Inflorescence an axillary head on 2.5–4 cm long peduncle. Flowers bisexual, regular, 5-merous, reddish white, sessile, subtended by up to 3 mm long bracteoles; calyx 2–4 mm long, with long tube toothed at apex, pubescent outside; corolla 6–9(–10.5) mm long, with c. 5 mm long tube, pubescent outside; stamens numerous, 2–3 cm long, united into a reddish tube for most of their length; ovary superior, c. 1.5 mm long, gradually tapering into an up to 2 cm long style. Fruit an oblong, flat pod 10–20 cm × 2–4 cm, with stipe up to 1.5 cm long, glabrous, transversely veined, glossy brown when ripe, opening with 2 papery valves, 9–12-seeded. Seeds flattened globose to ellipsoid, 7.5–12.5 mm × 6.5–9 mm. Seedling with epigeal germination; hypocotyl 4–4.5 cm long, epicotyl 1–3 cm long; cotyledons rounded to broadly elliptical, thick and fleshy, early caducous; first 2 leaves opposite, with one pair of pinnae. Albizia comprises about 120 species and occurs throughout the tropics. Approximately 35 species are found in continental Africa and about 30 in Madagascar. It is characterized by the head-like inflorescence, with 1–2 central flowers modified, functionally male and having a larger, nectar-producing staminal tube. Molecular analyses showed that Albizia is heterogeneous, and a revision is needed. Albizia zygia is related to Albizia gummifera, and hybrids between the two species have been recorded. Vessels: 5: wood diffuse-porous; 13: simple perforation plates; 22: intervessel pits alternate; 23: shape of alternate pits polygonal; (25: intervessel pits small (4–7 μm)); 26: intervessel pits medium (7–10 μm); 29: vestured pits; 30: vessel-ray pits with distinct borders; similar to intervessel pits in size and shape throughout the ray cell; 42: mean tangential diameter of vessel lumina 100–200 μm; 43: mean tangential diameter of vessel lumina ≥ 200 μm; 46: ≤ 5 vessels per square millimetre; (47: 5–20 vessels per square millimetre); 58: gums and other deposits in heartwood vessels. Axial parenchyma: 76: axial parenchyma diffuse; 79: axial parenchyma vasicentric; 80: axial parenchyma aliform; 81: axial parenchyma lozenge-aliform; 83: axial parenchyma confluent; 91: two cells per parenchyma strand; 92: four (3–4) cells per parenchyma strand; (93: eight (5–8) cells per parenchyma strand). Rays: 98: larger rays commonly 4- to 10-seriate; 104: all ray cells procumbent; 115: 4–12 rays per mm. Seedlings develop quickly, and can reach 3 m tall after 2 years. Trees are capable of growing rapidly and reached a bole diameter of 80 cm in secondary forest of 40 years old. The roots develop nitrogen-fixing nodules containing Bradyrhizobium bacteria. Albizia zygia trees live in association with arbuscular mycorrhizae. In Ghana trees flower from February to May, and ripe fruits can be found from November to April. The fruits dehisce on the tree and the papery valves with seeds still attached are spread by wind. In a plantation in northern Côte d’Ivoire, 5.5-year-old Albizia zygia trees were on average 3.7 m tall, with a stem diameter of 7 cm. Trees on old termite mounds were over 6 m tall with a stem diameter over 10 cm. In plantations in the evergreen forest zone in southern Côte d’Ivoire Albizia zygia trees had a mean annual diameter growth of 1.6 cm, against 2.1 cm in the semi-deciduous forest zone. Albizia zygia occurs in lowland semi-deciduous and evergreen forest, in East Africa up to 1400 m altitude. In West Africa it is most common in secondary forest in the semi-deciduous forest zone, but it can also be found in lower numbers in both forested savanna and evergreen forest. It is locally common and shows no preference for wet or dry sites. It is tolerant to acid soils and shows some drought tolerance. Seedlings are classified as non-pioneer light demanders. Regeneration depends on the presence of medium-sized to large canopy gaps in the forest. Consequently, seedlings and saplings of Albizia zygia are more abundant in forest with logging damage than in undisturbed forest. Seeds for planting should be collected from the trees before the pods dehisce. The 1000-seed weight is 50–60 g. In Côte d’Ivoire the germination rate of seeds soaked in water for 24 hours was 8–30% in 35 days; it was much better after treatment with sulphuric acid or mechanical scarification. In Ghana pre-treatment of the seeds with 98% sulphuric acid for 5 minutes followed by thorough rinsing in water improved germination by up to 85%, and mechanical scarification followed by soaking for 6 hours in water gave a germination rate of up to 95% in 8 days. In Uganda it is recommended that seeds be soaked in water overnight before planting. Seeds can be stored for some time in a sealed container in a cool place, after adding ash to reduce insect damage. Wildlings are sometimes collected in the forest for planting. Albizia zygia can be successfully propagated vegetatively by root cuttings; the application of indole-3-butyric acid improved rooting rates. It is necessary to protect young trees from cattle and wild herbivores, and to remove weeds during the first 2–3 years of growth. Planted trees can be managed by coppicing and pollarding. 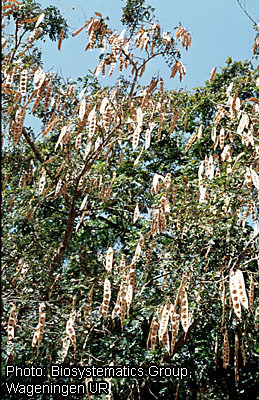 In Côte d’Ivoire a high incidence of attack by bruchid beetles on the seeds of Albizia zygia has been recorded. Serious attacks by borer beetles were recorded in the savanna zone, where many planted trees were killed. Freshly harvested logs sometimes float in water and can then be transported by river. They are also conveyed by timber trucks. 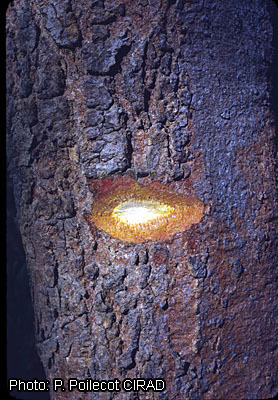 Although logs are moderately durable, treatment is recommended if they are left in the forest for some time, especially to protect the sapwood. Albizia zygia is widespread and locally common, particularly in secondary forest. This means that it is not easily liable to genetic erosion. However, harvesting the bark for medicine and for the gum may locally reduce population sizes of the tree. Albizia zygia is a multipurpose species. It seems to have good prospects as a commercial timber tree in sustainably managed forests, and also as a source of gum useful in the food, cosmetic and pharmaceutical industry. It has good prospects as an auxiliary tree in agroforestry systems, improving the soil with its nitrogen-fixing root nodules, providing mulch with its leaf litter, reducing erosion with its large rooting system, and protecting crops from too much sun. It deserves to be included in agroforestry testing programmes. Anim Kwapong, G.J. & Teklehaimanot, Z., 1995. Reclamation of degraded cocoa lands using Albizia zygia. Land Degradation and Rehabilitation 6(2): 109–123. Odeku, O.A., 2005. Assessment of Albizia zygia gum as binding agent in tablet formulations. Acta Pharmaceutica 55(3): 263–276. Odeku, O.A. & Fell, J.T., 2005. In-vitro evaluation of Khaya and Albizia gums as compression coatings for drug targeting to the colon. Journal of Pharmacy and Pharmacology 57(2): 163–168. Anim Kwapong, G.J. & Teklehaimanot, Z., 2001. Albizia zygia (DC.) Macbride, a shade tree for cocoa. The effects of duration of acid scarification and substrate acidity on the germination of seeds. Forests, Tree and Livelihoods 11(1): 47–55. Arthur, M., Mettle, I.V. & Owusu Sekyere, E., 1998. The effect of pre-sowing treatments on germination of Albizia zygia seeds. Ghana Journal of Forestry 6: 15–18. Arthur, M., Mettle, I.V., Owusu Sekyere, E. & Baffoe Bonnie, E.B., 1999. The effect of Bradyrhizobium strain inoculation on nitrogen fixation and growth performance of Albizia zygia (Macbride) seedlings. Ghana Journal of Forestry 7: 39–44. Asante, W.J., 1994. Identification and characterization of browse plants in Kumasi District, Ashanti Region of Ghana. MSc. Agroforestry degree thesis, Department of Agroforestry, Institute of Renewable Natural resources, Kwame Nkrumah University of Science and Technology, Kumasi, Ghana. 118 pp. Danquah, G., 2000. Vegetative propagation of indigenous Albizia species. MSc Agroforestry degree thesis, Institute of Renewable Natural Resources, Kwame Nkrumah University of Science and Technology, Kumasi, Ghana. 142 pp. Ghana Forestry Commission, 2004. Timber Industry Development Division Report. [Internet] http://www.ghanatimber.org. September 2006. Gillon, Y., Rasplus, J.Y., Boughdad, A. & Mainguet, A.M., 1992. Use of legume seeds by bruchid and anthribid beetles (Coleoptera) in a mosaic forest-savanna zone. Journal of African Zoology 106(5): 421–443. Hawthorne, W., 1990. Field guide to the forest trees of Ghana. Natural Resources Institute, for the Overseas Development Administration, London, United Kingdom. 275 pp. Kpikpi, W.M., 1992. Wood structure and paper-making potentials of Ricinodendron heudelotii and Albizia zygia in relation to Gmelina arborea. Nigerian Journal of Botany 5: 41–50. Okafor, J.C., 1997. Conservation and use of traditional vegetables from woody forest species in southeastern Nigeria. In: Guarino, L. (Editor). Traditional African vegetables. Proceedings of the IPGRI international workshop on genetic resources of traditional vegetables in Africa: conservation and use, 29–31 August 1995, ICRAF, Nairobi, Kenya. Promoting the conservation and use of underutilized and neglected crops 16. pp. 31–38. Wester, J. & Hogberg, P., 1989. New nodulating legume tree species from Guinea-Bissau, West Africa. Forest Ecology and Management 29(4): 311–314. Apetorgbor, M.M., 2007. Albizia zygia (DC.) J.F.Macbr. In: Louppe, D., Oteng-Amoako, A.A. & Brink, M. (Editors). PROTA (Plant Resources of Tropical Africa / Ressources végétales de l’Afrique tropicale), Wageningen, Netherlands. Accessed 11 April 2019. This page was last modified on 19 March 2017, at 16:56.